Are We Completely Wiping That Hard Disk? "I’ll just run DBAN on it and that will be good enough." Is that really good enough? What if the individual or business in question is required by law to complete an erasure protocol up to a certain level of security? In some countries, including the United States, laws requiring secure erasure of data are also accompanied with a punishment if the protocol is not followed, such as fines of $250,000 and 10 years imprisonment. Is your client’s company disposing of old hardware, or do you have a client with sensitive data who desires complete and total erasure of data? Jackhammers, wrenches, and explosives may be more enjoyable methods of destruction, but what if the user would like to use the old hardware for non-sensitive data in another way, such as an external hard drive for storing personal data of a non-sensitive nature? DBAN it, right? On the official dban.org website, DBAN is heralded as a “self-contained boot disk designed for consumer use”. The key word in that statement is ‘consumer’. DBAN and similar software intended for wiping hard disks are known as software based overwrites, or ‘clear level processes’, and are vulnerable to recovery without requiring laboratory methods. For instance, if you know what the HPA is (Host Protected Area), you’ll know DBAN doesn’t wipe it. Why should we worry about the HPA? The HPA can be used by rootkits to hide from Anti-Virus software, manifesting again upon a reinstall of an operating system. The HPA is also used by some vendors to store data relative to the installations of software. One security firm is known to use the HPA to load software that reports back to their servers when the machine is connected to the internet. An employee could use the HPA to store data which would be hidden from many wiping tools, and recover that data later after the drive had been supposedly ‘wiped’ of all data and considered free to use in other applications. In view of the above currently known uses, including the looming recent threat of cyberwarfare, this alone could present a high security risk for many companies and government entities. Many erasure tools do not touch the HPA or other hidden areas of the drive, which are inaccessible to many wiping tools. How can we effectively eliminate all data on the hard disk without physically destroying it? Secure Erase (SE) is a feature built into all ATA drives with 15 GB or greater capacity manufactured after 2001. There is also a Secure Erase command for SCSI drives as well, but you may not find it on all drives, as it is an optional feature. Basically, executing a SE command will virtually shred all electronic data on the hard disk in question. It will completely wipe the HPA and other hidden partitions on disk drives, which means any area of the drive which is available for hiding data will be completely wiped, beyond known forensic recovery. SE will also wipe sectors that are unused by the drive due to errors. It performs a single pass, and that one single pass is more than enough, as technical testing confirmed that multiple passes were unneeded as far as additional erasing was concerned. This single pass meets U.S. Requirements for secure erasure of data for the regulations concerned, with the exception of highly sensitive data which requires complete physical destruction of the disks. Unless you’ve got top secret government files on your hard disk, SE should fit the bill for most clients. A Freeware Tool That Implements Secure Erase? Due credit goes to G. Hughes of UCSD CMRR for this utility. I won’t go into the details of all the technical aspects of the utility, but there’s a data sheet referenced on the web site you can read that goes into deep detail on the methods used. Basically, HDDerase is a DOS-based utility for ATA hard disks. You can boot it with an antique 3.5 disk, or boot it from a CD. The last time I checked, HDDerase is also available on the Ultimate Boot CD, and is probably on a few other less known boot cd’s along with other tools useful to techs. It can also be booted from a USB flash drive as well. This utility can also bypass the ‘security freeze lock’ which the BIOS sometimes executes when it detects the drive. Make sure you use version 3.1 or later, as these versions allow you to remove the HPA as well as the DCO on the disk. While this tool cannot be guaranteed to work on absolutely every hard disk in the field, it has worked on every hard disk I’ve had thrown at me for erasure. Scan the readme file provided on the official site before running the utility, just to be sure you cover all your bases. Simply boot it up, follow the prompts, and you’ll have a forensically clean hard disk that is beyond recovery as far as data is concerned, and still have a usuable disk for other applications. Guest Post by Micah Lahren – Micah covers a wide spectrum of the tech industry, including PC repair, front-end development, WIMAX networking and installation, and more. He currently works with an ISP in Texas that also provides web hosting/design and computer repair, although he’s been tinkering with computers since he was 6 and eventually turned it into a career. He also enjoys traveling and doing volunteer missions in other countries. Does up-selling to your clients make you feel like a used car salesman? Most Computer Technicians come from a technical background so sales and marketing does not come naturally. Now that you are in business, sales is really something that you cannot avoid if you want to make money. I had heard about these WiseTechnician videos mentioned a few times in my Computer Technician circles that focused on the sales side of the Computer Repair business, and I wanted to check it out not only for myself, but for all of Technibbles readers to see if they are worth purchasing. This is my WiseTechnician review. The WiseTechnician videos are a collection of videos about the business and marketing side of the computer repair business. The package includes 26 High Quality 480p videos resulting in 3.5 hours of content. There are also audio-only versions of each of the videos so you can listen to them on the go. The package includes videos on a variety of topics such as what to ask the customer, stocking inventory and selling it, finding a wholesaler, parts and pricing, billing and accounting, working in small/depressed areas, managed services, getting business customers and more. The videos are done in an interview style over Skype with Steve Cherubino from Podnutz as the host. The videos are broken up into 26 different topics and each video ranges from 5 to 10 minutes in length making them 3.5 hours in total. Once you pay for the product via Paypal, you will be sent an email with login details to access the members only area on the WiseTechnician website which allows you to access the videos from any computer and mobile device capable of playing .mp4 files. Having the product stored like this is handy if you lose the videos because you can just login and download them again. So What Are The Videos Like? The videos are high quality Skype video calls and both Steve Cherubino and Chris Barre having good microphones and webcams. While the total length of the videos is only 3.5 hours long, there is little fluff in these videos and they are full of “gold nuggets” of information. In fact, while I was watching these videos there were many times where I thought “That tip alone is worth the cost of these videos”. The videos are like watching one giant Podnutz interview and Chris can quite animated. He really is a no nonsense kind of guy. A lot of technicians talk about ideas that they are going to try which may or may not work. I found the videos useful because they say “Do this, it works. Here is how to say it”. I have only two gripes with this product. First, there are a couple of points audio drops out, but only for a split second. I guess thats is the the nature of Skype. Second, I am not a fan of the site design as it looks too infomercial-like. However, the product itself is no-fuss, solid content. 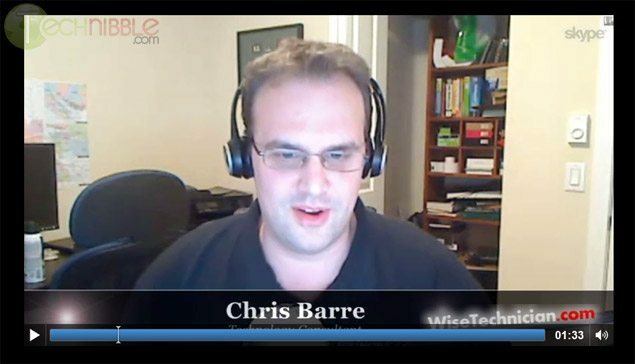 So Who is Chris Barre? Chris (the “Wise Technician”) has been doing computer repair for the last 7 years and has been sales for 14 years in both retail and business to business. He used to own an an applicance repair company which had a store front and as well as doing onsite applicance repair. That business is still going strong and had 5 employees when he sold it. Chris wanted to make a product that helped Computer Technicians make some serious money and get over the “computer guy shyness”. He has been talking to Computer Technicians for the past 3 years on the Podnutz network and their issues always came down to them not charging enough, feeling bad for making “too much” profit on a product, and not being able to sell new services and products to their existing customers. Who Is This Product Not For? If you have been running your business for many many years (Say, 5 years plus) then you are going to get less out of it. That is not to say you wont get anything out of it as the videos are a combination of startup tips and sales tips. I myself have been in business for about 10 years and I still got sales tips out of it that would make it worth the cost. If you still dont feel comfortable with sales then you will find the product useful. The videos are not for you if you dont plan to invest the time to actually watch/listen to the videos and impliment the tips. This is not a get-rich-quick plan. If you are within the first few years of your business, you will get a lot of great tips from these videos. As mentioned above it covers both startup tips (such as how to find a supplier) as well as sales tips. I know most new computer business owners dont feel comfortable about sales since they came from a more technical background. They often feel like a sleezy car salesman when trying to sell. Chris gives you some really elegant ways to sell to your clients without feeling like a scumbag. The product retails for $79.95 and comes with a 60 day money back guarantee. There is really is no reason not to give them a try as it is risk free. Last week in The Force Field Forums, we got spammed. We get a lot of forum spammers every day. 24 hours a day, seven days a week. A lot of them are spambots, a few of them are real humans, but nearly all of them we catch before they even get approved for membership in the forums and all of them are immediately banned. Okay, that’s not news. Hardly enough to write about in a blog, right? Except for this spammer. This one was different. This one got through. And this one was representing a new, legitimate business. So the Admins trashed the post. But we didn’t ban this spammer. Nope. We’ve banned over 125,000 known forum spammers and its time to set one straight. So we’re going to give this spammer an education. But it’s more than that. It’s a learning experience for all of us trying to make it in a Web based world of business, particularly in IT. It’s a lesson in how to market our businesses to others and build a good, solid business reputation and reputable brand with etiquette, ethics and finesse. The individual who spammed The Force Field Forums was a representative from Sevacall, a new startup that has been in beta mode for awhile and just officially opened its virtual doors June 13, 2012. Sevacall is a “lead generation” type service platform that connects clients with service providers over the telephone. Just when you thought you were done with services like Geekatoo (Geekatoo? Really? Sheesh! ), along comes Sevacall. Yes, I know it’s quite innovative and all to be another lead generation platform on the web with the same old “connect Buyers and Providers for the lowest price” line, but what makes it really unique? Spamming forums to recruit service technicians? Trying to alienate their provider base right out of the gate? Well, so far they’re off to a great start. I noticed you signed up for our forums recently and was approved for membership. Unfortunately your first post was flagged by a member as spam and subsequently moved to the trash folder by our Admins. The forums are a place to network with other members and self-promotion is encouraged within reason. While we do encourage our members to promote themselves and their businesses, there is a certain standard protocol for this. To avoid confusion or misunderstanding, we do request that all new members read the forum rules before they post for the first time. You can read the forum rules at http://www.theforcefield.net/forums/index.php?topic=5292.0. You may be surprised to learn that spamming the forums certainly did not win you any friends in there. This is unfortunate, since Sevacall is a potential resource for techs in The Force Field and, had you done this properly, you could have actually won some of them over to your service. It’s all in the approach. You likely found The Force Field Forums by Googling for sites with keywords related to Thumbtack and Geekatoo, which you may consider as your primary competitors when recruiting techs. While that may a logical procedure for recruitment, it isn’t the only one, and as you have probably discovered by now, spamming the sites that appeared in the search results is hardly effective and can actually make more enemies than friends, ultimately hurting Sevacall’s reputation. There are other less intrusive and more effective ways to accomplish your goal. One tried and true method is by (gasp!) advertising in the right venues to your direct audience. Yes, it costs money, but if you’re going to invest in the other aspects of a legitimate business, marketing your business is very important, so you can’t skimp on that if you want to do it right. There are also FREE ways to market your domain that are ethical and highly effective. (spamming the domains of others is NOT ethical and can actually be self-destructive). One powerful, yet cost effective way is through product or service endorsements on blogs and social media networks. Yes, it takes more effort on your part, but it can be well worth it in the long run. It can even boost your reputation in a positive way, if you do it right. A third way is the one you encountered June 18, 2012 at 2:29:48 PM – the exact day and time you registered for The Force Field Forums. Had you bothered to explore the entire site before you made your first post, you would have discovered great potential for promoting Sevacall – most of it absolutely FREE!! Since you probably didn’t do this (or you wouldn’t have spammed the forums) you probably don’t know who I am and you probably don’t know what The Force Field is, thus you probably have no idea what I am talking about. So I will explain it to you. Then there is the podcast. Yes, we have a podcast, an Internet radio show that is heard on-demand in over fifty countries around the world. An interview on The Force Field show is a great way to reach techs globally and recruit them for Sevacall in a positive way. Best of all it’s free publicity. You can’t beat free. Had you looked over the site, checked out the show and contacted me first, things would be a lot different. I would have invited you into the forums, written Sevacall up in my blog with links to your site, and – yes, I would have offered to interview you for The Force Field show. Yes, entering The Force Field community, getting to know it first, reaching out to me and the other members and actively engaging in meaningful discussion by networking socially takes a little longer, and is more work on your part, but the long-term rewards are worth it, as you could have built a long-lasting, trusting relationship with the techs you wanted to recruit and develop a great reputation for Sevacall. But you didn’t do that. You didn’t even try. Unfortunately, instead of participating in The Force Field community you decided to go for the quick and easy, drive-by, one-shot spammy post. Instead of introducing yourself and your company and identifying yourself as a representative of Sevacall, you attempted to pass yourself off as a peer, a tech who uses the platform, which was disingenuous, misleading and dishonest, which does not build trust in the company at all. As someone with some experience in marketing and promotion, I can tell you that you made all the mistakes of someone who does NOT understand how to market a business to professionals in a social network on the web. Normally, our Admins at The Force Field would simply trash your post, send you a warning e-mail (which they already did), and, if you did it again would simply ban you from the forums permanently. However, this time I decided to do something a little different. Collectively, the anti-spam system, the other Admins and I have already banned over 125,000 spammers and I’m getting just a little tired of it all. So, this time I’m going to make an example of Sevacall. I’m going to use you as an example of what happens when a company does all the wrong things to market their business and alienates the audience they are attempting to reach instead of endearing them to your company. But I’m not going to be mean about it. I will admonish you for your uncouth behaviour, yet reach out to Sevacall and give you folks a chance to do it right. Now, if you really want to do this right, start with the introduction. Please identify yourself and your position with the company. Who is HeretoHelp? Are you Gurpreet Singh, the CEO? Are you the president and COO Manpreet Singh? Are you one of the other members of “The Team” (as you call yourselves) at Sevacall? Or are you one of the 17 interns listed on your site? (Don’t tell me the company is entrusting its online reputation with an intern). Second, don’t misrepresent yourself. If you work for Sevacall (which, according to your e-mail and IP address you do – yes, I checked, it’s Sevacall’s IP) then just come right out and say so. Don’t pretend to be a tech who uses the service and likes it better than the others. It’s called a lie, and businesses that do it don’t earn anyone’s respect or trust in this community or the marketplace in general. And third, you owe the members of The Force Field Forums an apology. You need to apologize for intruding on their discussion without a proper introduction, for lying to them about who you are, and for interrupting a serious discussion to promote your service. Yes, other people do it, and some other companies do it, but they are usually less than reputable and I don’t think you really want your business to have that reputation, do you? Now, some of the damage has already been done. For starters, you don’t get an interview on The Force Field podcast at this time. Also, Sevacall reminds me too much of Service Magic with telephones, and I was already burned by them a few years back. Service Magic was prone to what I call lead fraud, much of it perpetrated from within the company itself. Sevacall is about phone leads, a technology with its own potential for abuse. So, don’t look for a personal endorsement from me, because I generally don’t trust this “lead generation” type of service platform. I hesitate to sell you any ad space in the show or on the web site, either, because although our rates are reasonable – as you can tell from our media kit – it’s reserved for products and companies I have vetted and I can personally endorse. But I will do this. I will devote an entire post in my blog to Sevacall and give you a few links back to your site. I’ll even do it FREE, with no reciprocal link or other compensation expected from Sevacall in return. In fact, I’ve already done it. You see, what started off as an e-mail in response to your spam post in my forums turned into a blog post for the front page of The Force Field web portal. The topic? My new approach to fighting spammers – or how to market your business in The Force Field. So, you get some promotion for Sevacall after all. It’s just probably not what you expected. And if you spam the forums again, I’ll post another one. And then I’ll ban you. Permanently. Harsh? Maybe. But after dealing with over 125,000 forum spammers, it’s time to draw the line and fight back. You just happened to be the next one in line to cross it. Isn’t that what you wanted anyway? A quick and easy, drive-by, one-shot spammy post promoting Sevacall? Well, you got it, right in my blog for the entire world to read. And it was FREE, compliments of The Force Field. But, hey, you earned it. The SUPERAntiSpyware competition has come to an end and the winners have been randomly chosen. To make sure it was truely random, I used the lowest comment ID and the highest ID that was still within the entry dates. I went to Random.org and generated 20 random numbers between these two numbers. I then linked the random numbers to the corresponding comment IDs (minus comments that didnt enter the competition but commented on Technibble during this time). Congratulations guys! Your license keys should be in your email. I would like to send a big thank you SUPERAntiSpyware for supplying the licenses and thank you to those who entered! Ottawa Computer Services. Taleam Systems offers desktop and laptop repair in Ottawa, Ontario at affordable rate only $30 per hour. We can fix your computer if you are having Windows problems, Virus issues, hardware problems, network issues or printer problems. The makers of SUPERAntiSpyware (which is a malware removal product that many technicians use) have provided me with 20 SUPERAntiSpyware Professional licenses to give away to Technibble readers. If you havent heard of SUPERAntiSpyware, SAS is a security application that detects and removes Spyware, Malware, Rootkits, Trojans, Hijackers and other malicous threats for Windows users. Some of the newer features that are of interest to computer technicians include the “Rescue Scan” where it allows SAS to recoup processing power from CPU hogging malware in order to put more power and resources behind the scanning engine. Some computer technicians are not a fan of SAS while others absolutely swear by it. This competition is for the latter. We are giving away 20 licenses for the SUPERAntiSpyware Professional Edition (worth $29.95 each!) which includes extra features over the free version such as real-time protection, scheduled scanning and automatic updates. Leave a comment on this post. You don’t need to register here in order to leave a comment. Just enter your name, email and leave a comment. The winners will be chosen at random on Friday the 22nd (1 week from now). Instant Virus Removal Support From FixSmith !!! The possible reasons for PC problems are multiple. Viruses Infections, malware or spyware are typical problems that are experienced with computers. These infections are seen as a a lack of files unexpectedly, programs which are acting randomly, and also the computer responding slowly to commands. If Skilled technicians have found a few of the symptoms on your PC, then repair really should not difficult. It does not take too much time. YUMI (which stands for Your Universal Multiboot Installer) is a tool that allows you to install multiple operating systems to a single bootable flash drive. YUMI will automatically create a menu allowing you to choose which operating system you wish to boot into as the system starts. We have featured mutliboot creators in the past but I really like YUMI because it is just so easy to use. To use YUMI, you simply choose the drive letter of the thumb drive you wish to use, select a distribution you wish to install from the list, tick the “Download the ISO” if you havent done so already, wait for the ISO to download, navigate to the download location of the ISO on your hard drive and press Create. Thats it. To add an additional ISO to the USB drive, just do the steps above again. Even though the boot menu and the ISOs installed on the USB drive are Linux based, you can still use the same drive to carry your Windows based repair tools since it formats the thumb drive to FAT32 – which is readable by Windows. However, I suggest you don’t move any of the files YUMI placed since it may upset the software installed on it. If you happen to install multiple operating systems to your USB key, YUMI will categorize them as you can see in the screenshots.